Your customers depend on you to install a food service cooler that is affordable, reliable, and guaranteed. SRC Refrigeration has been designing and manufacturing custom food service refrigeration units for more than 3 decades. Our custom walk-in coolers are made in Michigan using American parts. We pack and ship to your location near Atlanta GA in one shipment, making it easy for you to install the unit and get it up and running. SRC Refrigeration manufactures the highest quality beer caves, restaurant coolers, food service coolers, floral coolers, funeral coolers, combo units, and industrial coolers of all shapes and sizes. We are the preferred choice for contractors and re-sellers. Our access to a wide array of medium-temperature and low-temperature systems allows us to design the right refrigeration system for every indoor and outdoor application. Our refrigeration experts are able to quickly plan a custom floral merchandiser that is sure to capture the attention of your client's customers. With SRC, you are never limited to a few designs or options. 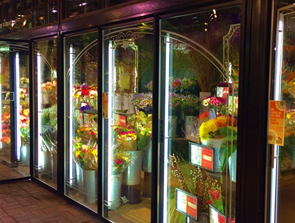 We will work with you to make the best use of your available space while building a highly efficient, quiet, beautifully illuminated walk-in or reach-in refrigerated floral display unit. We believe in our products and stand behind them! SRC Refrigeration provides some of the best warranties in the business. While others charge extra for them, we include our warranties at no additional charge. Please click on the links to see our panel and product warranties. If you have any questions, please give us a call and we'd be glad to help! We've worked very hard to create an efficient process and purchase our raw materials more effectively, and in the end we've made sure that these efficiencies translate into a complete packaged system that is an overall great value for our customers. Our competition may provide a short or optional warranty, but we include the best warranties at no additional charge. If you believe in your products, and work tirelessly to make them better than the rest, why not stand behind them? You shouldn't have to add or make a choice whether you want a warranty or not. It should be included and the company should stand behind it. We do that. We couldn't be more happy with the cooler. It fit great and was built perfectly to spec. The install drawings were easy to follow and we had no trouble putting it together in less than 30 minutes. Thanks for everything, we will definitely look to you guys again in the future! The contents of this webpage are Copyright © 2019 SRC Refrigeration. All Rights Reserved. SRC Refrigeration manufactures 100% American Made custom cold storage systems. Call us for a same day quote and the best prices for: Commercial Refrigeration, Walk-In Coolers, Walk-In Freezers, Walk-In Combos, Beer Caves, Beer Growlers, Commercial and Industrial Coolers. SRC Refrigeration coolers are operational in all fifty states and 15 countries worldwide.